Is THIS the Last Rose of Summer? Photo treated with a Photoshop Action to age it. This all started the day after Thanksgiving this year when my daughter called me and asked for my aunt's pumpkin pie recipe. Well, it HAS to be right here. I searched the recipe books stored over the microwave...nope. I started opening pantry doors and found a stack of older recipe books I had stashed there, oh, maybe a year or more ago but none of the old recipes were there. I searched all day with no success, although I found a lot of other collections. The next day I was getting out the craft materials, keeping an eye out for something that COULD be recipes. There was a clear plastic bag...it looked like a bunch of random pieces of paper. It was the whole collection of old recipes I had put in with some recipe-by-mail program MANY years ago. I thought they were still all in the plastic box but now I remember that the box broke and I shoved the contents into this bag and hid it in the closet because I was too busy to deal with it. Well, the pumpkin pie recipe was not there but I found it on the Internet. It used Dream Whip so I knew that site would have the recipe. What I found instead was my mother's fudge recipe. I have never had any other fudge that comes close...I was raised with THIS fudge and anything else is counterfeit in my mind. I can so clearly remember making this fudge with my mother and, indeed, that is exactly why I felt the need to start cooking with my granddaughters. If you did not make this at the knee of someone who has made it before you will end up with something less than the REAL fudge. So when it was my younger granddaughter's "Special Day with Grandma" we set about making Grandma's fudge. 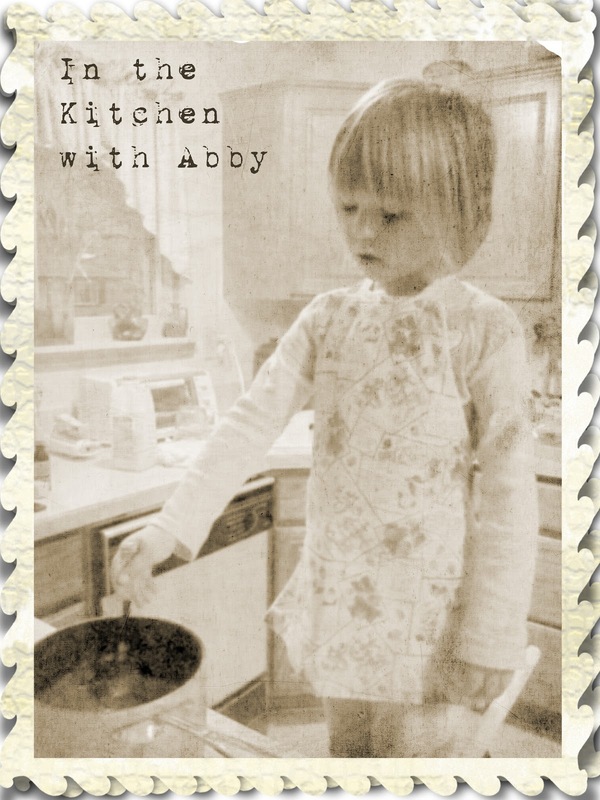 Oh, the original recipe was in my mother's high school home economics text book. I really can't imagine teaching a whole class of young ladies this recipe...especially a room full of 1920s flappers. Combine sugar, cocoa and milk in a large saucepan. Bring to a boil stirring constantly. Cook slowly while stirring until mixture lumps when a bit is dripped into cold water. (this could take the better part of an hour). Add butter, vanilla and salt. When butter melts, beat until a shine appears and fudge is thickening. Then pour quickly into a greased 9" by 9" pan. Cool, score, and serve. It is October 19...October 19!!! This rose bush has grown larger, faster, and fuller than any other one I have ever grown. None of my mother's roses ever got this large. It looks like the rose bushes we see in Florida that have all year to grow. I hate that I am going to have to cut this down for the winter and cover it with a Styro-cone. The trellis behind it is not because the bush is a climber...it isn't. 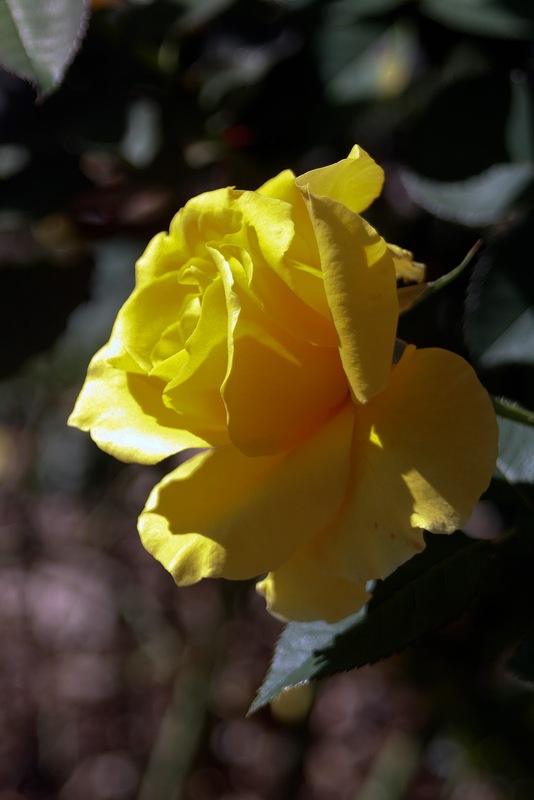 It is a hybrid tea called Midas Touch and it has been in my yard for two summers, now. I use a Bayer rose food that is dry grains, a handful scattered around the base of the rose before I put the mulch on in the spring. That's it and I did the same thing with the neighboring roses. I have NO idea why this one took off so much this summer, or if it will do it ever again. Honey bee...I hope I can keep these happy. What a gorgeous day! The afternoon sun made every insect flitting about my garden so eye-catching that I just had to grab the camera. The weather was so gorgeous that we went for a little ride around the Lake Erie Metro Park, camera in hand, of course. The Picnic area is right on a bay that invites migrating and non-migrating birds to stop over. Last year I only had my purse camera when I discovered the gathering of birds. The next day when I returned with my DSLR camera all of the birds had left. This year I had the DSLR with me and got these photos. Seagulls, ducks, swans and geese all in one shot! This is a small sample of the hundreds of birds in this bay. While I was there quite a few swans and geese came in and joined the crowd. Above is a small flock of swans that flew in from Canada in the background. A few minutes later a couple of small flocks of geese came from the same area, flying across from Canada. I liked the swans peacefully swimming (here in the US) with the Canadian Wind Farm in the background. Here on the US side is a collection of waterbirds in front of our power plant. Will this bush bloom forever? Hard to believe that this is nearly October. Last week we had several days in the high 80s and two times we attempted to swim in the pool. The days might be unseasonably warm, but the nights are still cold so the pool water looses whatever heat it gathered during the day. So...Gabby didn't go in at all and Abby and I only to our waists. The garden is overgrown but still producing some pretty flowers. The roses, especially, have never stopped producing blooms. Some annuals are at their peak and some are slightly over peak. It is still interesting every day. I have started holding off on feeding the birds to encourage them to start their migration. Those who stay will have plenty to eat with the plants and berries in their harvest mode. I won't be here in the winter so I should not make them dependent on my feeders. Next week I will bring in all the feeders and clean and sterilize them for next spring. Through the window, this time. The hedgerow at the back is the neighbor's but serves the purpose of shelter, hiding, nesting and mating area for the birds and other small animals. The pumpkin vines are overgrown and need to be pulled out. We have 6 good pumpkins and 2 that rotted. The corn stalks will become a decorative shock on the front porch for the autumn. I was going to pull out all the other annuals for the winter but a Downriver Garden Forum member mentioned that she keeps her annuals in because they look so interesting in the winter with the snow on them. I am willing to try that and clean up in the spring. The roses will get their winter styro cones, though. I now have 9 to cover. I need a few new cones for the additions. My first digital photo was in Florida of a nearly 5 foot tall Sand Hill Crane. This week, in Michigan, I finally snapped the smallest bird...a wee hummingbird. She must have needed to rest. 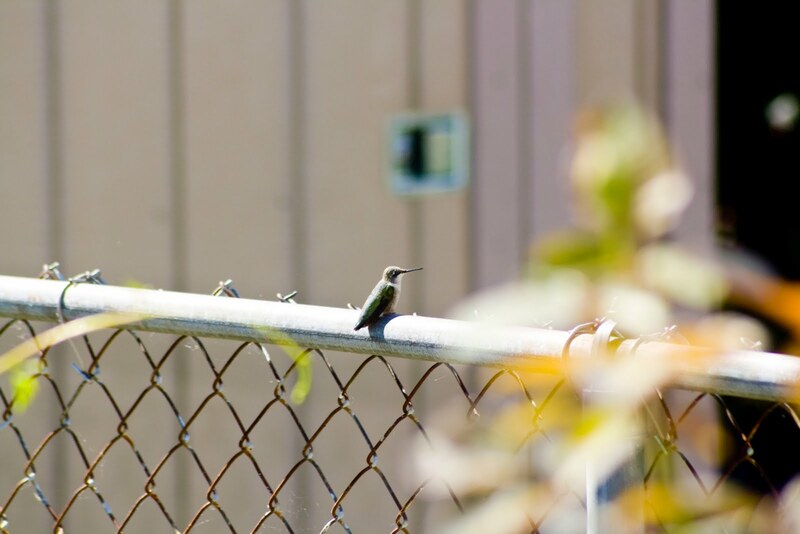 She stuck around for quite a while, even resting on the fence for a few moments. The Cleome, Zinnias, and Cardinal Vine kept her quite busy while I fiddled with my camera. One of the reasons the Snowbirds travel North when they do is to be away from the South during hurricane season. Although I worry about a cousin and his family in North Carolina and a daughter living on the Jersey Shore, we usually just see hurricanes on The Weather Channel. Our town in Florida was hit badly a few years ago in September, but we didn't arrive on the scene until January. So imagine my surprise when, just as we were concerned about a daughter in New Jersey, our little Michigan town was struck with a storm, the likes of which we had never seen. We were in the truck headed out of town to pick up a granddaughter from school for her "Special Day" with the Grands. It JUST started sprinkling as we left the driveway. As we crossed the first bridge the wind was so strong that there were little water spouts and white caps on the canals. Four blocks further and we could hardly see through the rain. Before we had gone a mile we had to pull over. He NEVER pulls over! We figured if we just got on the highway we would be able to see. Nope! I called daughter to arrange for the granddaughter to be picked up and we waited out the storm in a bar parking lot. The whole thing took about 15 minutes. As we reentered town we could see amazing damage. A swath about two blocks wide from the high school, East to the River...wind-whipped and damaged. ..DAMAGE SURVEY COMPLETED IN SOUTHERN WAYNE COUNTY...A STRONG STORM PASSED THROUGH THE DOWNRIVER COMMUNITIES THURSDAY AFTERNOON BETWEEN 230 PM AND 245 PM. AN NWS TEAM SURVEYED THE AREA THIS MORNING AND FOUND THE DAMAGE TO BE THE RESULT OF STRONG STRAIT LINE WINDS. THE DAMAGE BEGAN IN THE WESTERN GOLF CLUB NEAR SOUTH ROCKWOOD. ..WHERE DAMAGE WAS CONSISTENT WITH WIND GUSTS OF 70 MPH. THE DAMAGE PATH THEN WIDENED TO THE NORTHEAST THROUGH ROCKWOOD AND GIBRALTAR WHERE THE DEGREE OF DAMAGE SUGGESTED WIND GUSTS OF 60 TO65 MPH. THE FACT THAT THE WINDS DECREASED IN SPEED AS THE DAMAGE PATH FANNED OUT IS CONSISTENT WITH STRONG THUNDERSTORM OUTFLOW OR STRAIT LINE WINDS. THERE WAS QUITE A BIT OF TREE DAMAGE ALONG THIS PATH AND THE ROOFS WERE BLOWN OFF OR HEAVILY DAMAGED ON TWO GARAGES AND A POLE BARN. This really was a photo of my granddaughter playing dress-up, but it will also serve as a look at the garden right now. The zinnias on the left are about 5 feet tall and just starting to lay over. The pumpkins on the right are amazing. There are 8 plants with about a dozen pumpkins. I don't know how big they will get or how well formed but Halloween is looking good!!! Back in 1943, my grandmother who lived in this same town, had a nest below her bedroom window. One day the mother just didn't return. My parents took the 5 and we took turns feeding them some formula suggested by a veterinarian-friend of ours. 3 lasted only a day or two but two grew and thrived until late summer when they grazed on some grass that had weed-killer on it...where a neighbor's yard bordered our own. 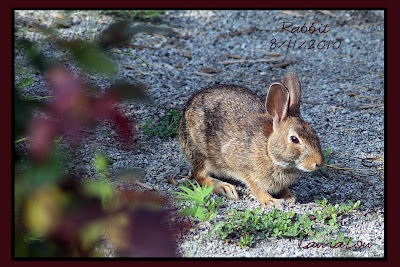 I knew our bunnies COULD be saved, but I also knew the likelihood of survival was best if left to fend for themselves. I think Survivor will probably find a winter home under my back porch and we will see him (or her with a brood) come spring. The focus isn't just where I want it but, darn, those butterflies move around so fast! Almost as bad as Hummingbirds, which seem to be scarce so far this year. I do love my Finch pair. They are ignoring my finch feeder and feeding from the regular feeder for some reason. I have really washed out the finch feeder well to be sure there isn't any mold but they will still only eat from it when it is 100% full. It has hung there for a week at the half full point several times this year and never emptied. Anyone with a clue? None of the feeding holes are plugged. This has to be the best time in the garden! 2010 has been hot; I mean HOT! My watering has been sporadic depending on the weather, but storm after storm seems to split and go around us. Once in July we did receive a 3" rainfall at night. My rain-gauge measured just a hair over 3 inches. Otherwise, I have been depending on a soak-er hose through my roses, past the Cardinal Flower vine, through the vegetable garden (now taken over by pumpkins), and into the Nasturtiums. 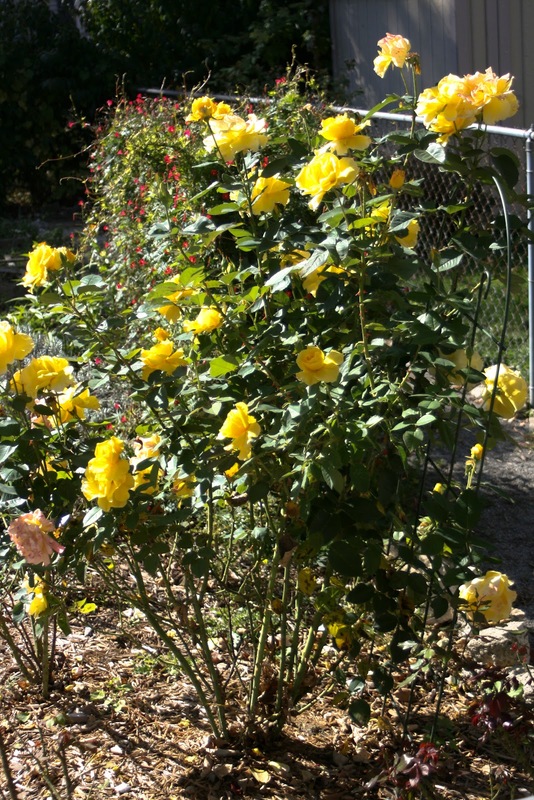 The Midas Touch roses are still blooming like crazy but the others are just putting forth a few blooms. Late last month a new neighbor decided he didn't want the upkeep of the roses the former owner had left. He gave 2 to the neighbor between us, who only wanted one. She asked if he would mind her giving the other to me and he mentioned that he and his children enjoy looking at my garden from their yard. When I had chance to thank him, he offered to bring over the others he was taking out. Two of those "mystery" roses are showing growth, even if it is late in the season. I will see that the new four along with the existing 5, will all be covered with styro cones this winter and we will just see what spring brings. I usually plant a few seeds in spring which, like the vegetables, are mostly for my granddaughters. The life cycle is so important and so few children have experience with planting, watching maturing, collecting seeds, and planting those seeds the following year. Believe me, my granddaughters KNOW that plants come from seeds and produce more seeds. They love the Cleome above because of the unique flower heads and seed pods. 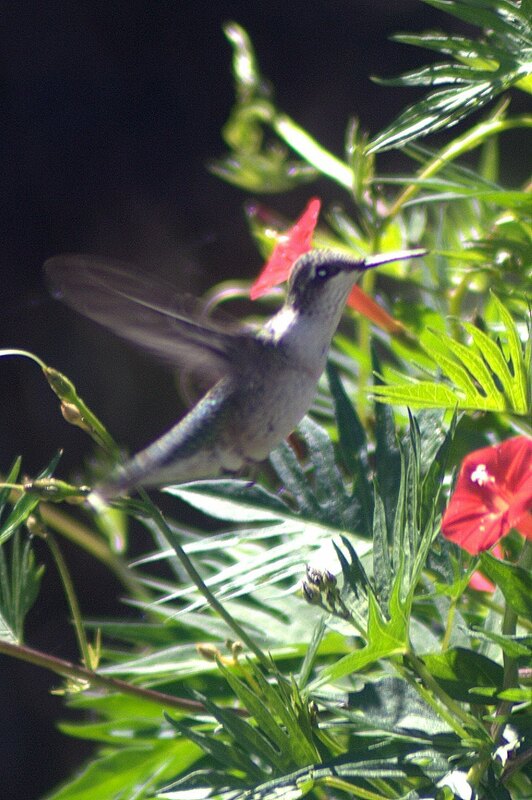 The pungent scent seems to attract butterflies and hummingbirds, too. The older granddaughter (7) MUST have her Zinnias every year. This year we planted small yellow and brown "carpet Zinnias" along one side, other small bush ones on the other side and several varieties of tall cutting Zinnias in the center. It worked; the color is great; and she has plenty of flowers to cut for her mother. That brings us to the pumpkins. The mice left teeth marks in the biggest so far but we are watching the color deepen and enjoying it in spite of the scars. The next biggest has a few marks but no more mice (or squirrels or rabbits, maybe?) so that might become a jack-o-lantern in October. As others come along the neighbor children are putting their names or initials in the skin with a pen. Those marks will scar and make interesting names on the mature pumpkin, rather like the mice's teeth marks. Every day is an adventure. Butterflies and, soon, humming birds will keep our attention as this month marches along. This is a first for me but my granddaughters are fascinated. When my pack of "especially for children" seeds arrived from Renee's Garden Seeds there was a pack of "Cinderella's Carriage Pumpkin" seeds. My granddaughters and I planted 8 hills of seeds (2-3 seeds to a hill) around the outside of the square foot garden. Within a few days the seeds had sprouted and we picked the best seedling on each hill and pulled out the other(s). In no time at all this is what it looked like. Where are these vines going? I sort of knew that pumpkin vines take up room but now I am really curious as to how big these things are going to get! I guess I sort of expected them to be miniatures. Here is our first little pumpkin. I think there are others but this was the one out where I could see it. We have some cool things to try if we get more than a couple of pumpkins. Back in May I ordered some stacking planters for my front porch railings from NJ Supply Ltd. I had seen the planters in a flea market in Florida but didn't want to haul the planters back to Michigan. When I started looking on the Internet, the sites I had copied were down. Then I found the planters on Home Shopping Network. Now they are back on the above website. I had a couple of hanging planters created by my son-in-law, who has a high school greenhouse for his Agriculture classes. I took apart the hanging planters, which typically overgrow and are hard to keep watered. The new planters have a reservoir of water and will not require daily attention. Here they are as of July 9. Not trying to sell these things, just really happy with mine. The smaller pots can stack together and there is an addition that lets you string them and hang them. This is a triple planter I have had for 3 years. I bought new cocoa liners this year and split up another pre-planted pot from a garden shop and divided it up among the 3 tiers. These two chairs were part of a bistro set, but when one chair split and could not be used as intended, it became a garden chair. This year I acquired the other and placed the pair in front of a window. Again, I split up a couple of over-the-hill pre-planted hanging baskets. This is the "View from my Office (thank you for the idea, Marge Lundy,,,who is a full time RVer and takes photos of the changing scene from her office window daily). If you look closely you might make out the several bird feeding stations here and there. The camera is always at the ready because you NEVER know. Today I filled the little cups with grape jelly on the Oriole Feeder and spiked an orange half where it belongs. You can just see a touch of color beyond my camera way out in the yard against the fence. Within minutes the female oriole was sampling the jelly. I have seen the flashes of orange around and figured they were looking for the feeder which was new last July. I just didn't expect they would be here so quickly. The male was not far behind. In fact, I was still at the camera when She left and He landed. Now I feel guilty for waiting so long to get the feeder out there. Next goal? Finding their hanging nest in the tree behind my yard. I know it is there because they come from and go to that tree all the time. I looked with binoculars after the leaves fell last fall but never spotted it.